My colleague, who is decades younger than me was positively influenced to pick up mountain biking. He came from a culture where riding is the mode of transportation. He rode daily to school, even going to shops and social events. The village where he came from were mountainous, and gravels trails were considered road. He had no idea what gear shifter was, as they only rode elephant steel bike with fixed gear. 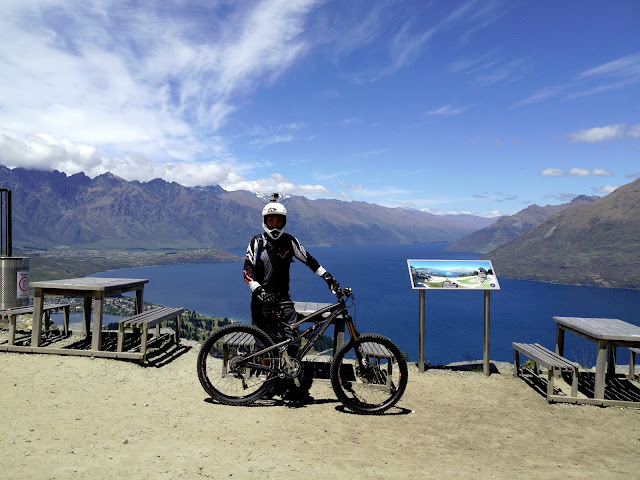 Consider that kind of training he had gone through over the decades, and the number of riding hours he had clocked, trail riding in Singapore should be a breeze for him. For what he had gone through, I would not blame him when he bought a market bike from supermart despite being briefed on the physics and science of mountain bike. Well, I guess in science we need factual evident to prove a hypothesis. Unwillingly (as I know what will happen), I agreed to test ride the market bike at Gangsa and T15. The virgin ride on Singapore easiest bike trail substantiated my hypothesis that market bike is structurally unsafe to be ridden off-road. 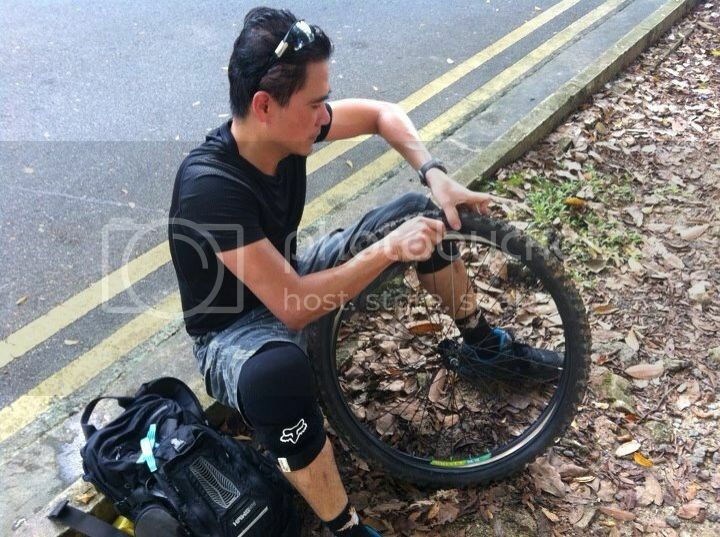 The first sign of failure showed up when the front wheel jammed while climbing an easy slope. The front skewer needed to be loosen in order to free up the wheel. The dilemma was to chose between the two evils, a jammed front wheel or a loosely secured front wheel. The choice was obvious as we need to ride out of the forest. Half way through the ride, the v-brake failed to work properly after riding through a patch of muddy water. The unreliability of the brake (2nd failure) further substantiated my hypothesis. 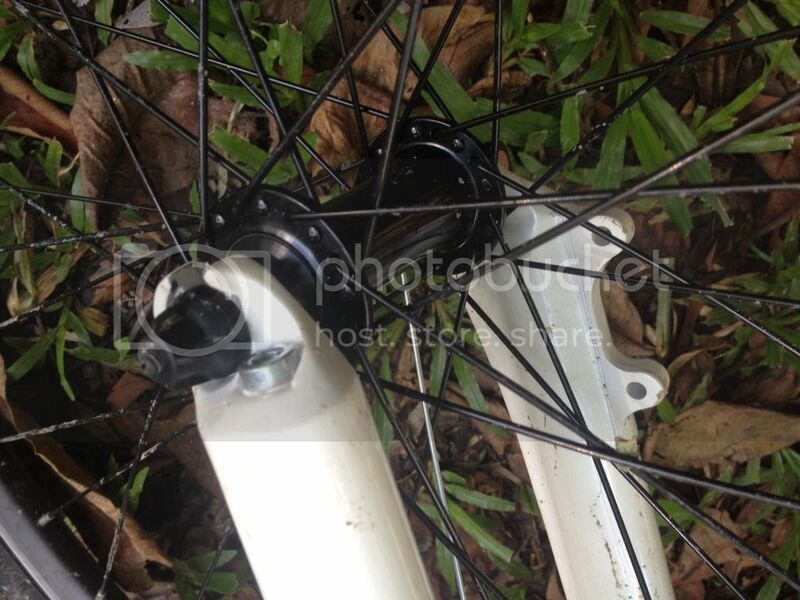 The second test ride was performed at the Bukit Timah bike trail. The ride was totally disastrous, and it proved my hypothesis without a doubt that market bike is structurally unsafe to be ridden off-road. The third failure showed up when the front tire punctured (See right photo, I was replacing the tube). Come on! they were brand new tire & tube, and we not even covered 2 kilometers of smooth off road! Well, we changed the tube at the car park just before the rock garden. Refusing to give up, my friend continued with the ride up hill. He paid a heavy price for his stubbornness (but I respect his persistency spirit); he crashed 3 times along the way due to failure of fork, brake, drive train and possible wheel jammed. He finally conceded defeat, and agreed that market bikes from supermarts are structurally unsafe for off-road ride. We did not complete the trail, which I usually take 40 minutes to finish one loop. We pushed the market bike all the way back, and he needed medical attention for bruises all over his body and possible breaking his three left fingers. We have proven the myths of market bike to be true...mmm...I should rephrase it: "The results of the experiment has positively substantiated the hypothesis that market bike is structurally unsafe to be ridden off-road". Hi Chris, good to see you on Sat. 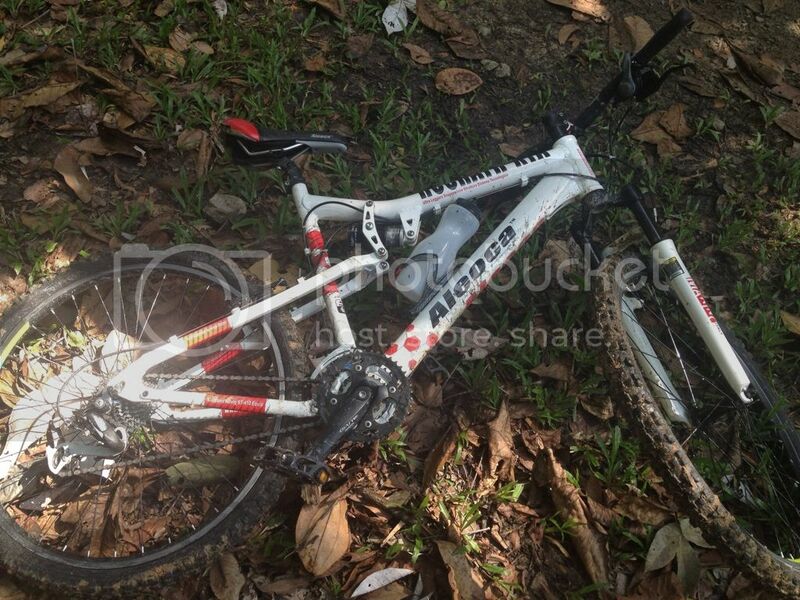 So, the 'market bike' belonged to your friend. Hope he's fine. Is your "Test Rider" recovering? Thanks for the information. On the otherhand, I have another friend who use his market bike for about 3 months before it fails...maybe the speed and terrain affect the performance as well. 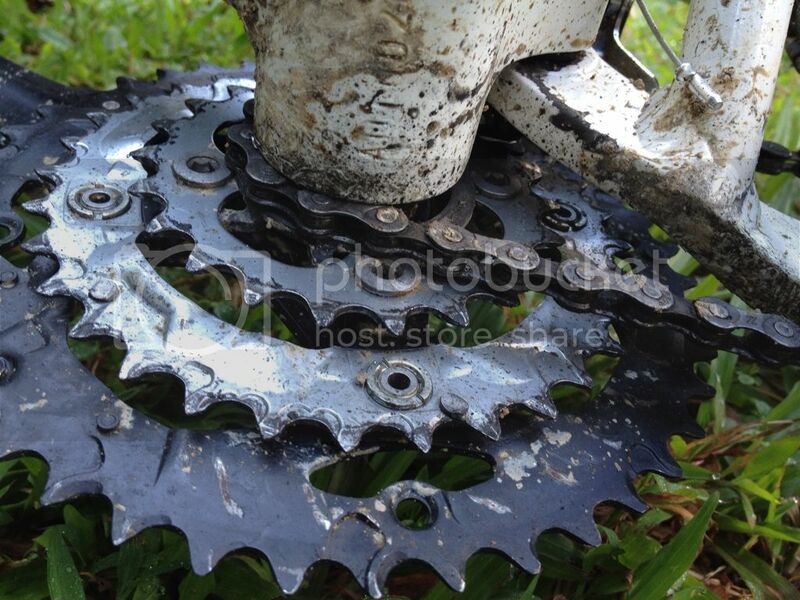 Hi Alex, agree with you that v-brake is not suitable for off-road ride, especially wet downhill trail. You are right, the rider pedaled quite fast during test ride, and attempted to hop over obstacles along the way. After all, this is what we do in off-road. He is ok now, trying to get rid of the market bike and invest in a good and discern mountain bike. I agree market bikes are definitely not safe for the trail, but I wouldn't say v-brakes are not suitable for off road. We used to use v-brakes in the 90s for these same trails! They were one of the strongest brakes available then - aside from Magura hydraulic rim brakes. But yes, some skill was required to control the power of good rim brakes - modulation is much easier with disc brakes. Agree with you that skill is needed to ride v-brakes bike on BT trails. I have seen folks riding hardtail v-brake bike on BT. Though the components are old school, they are so much robust than that of market bike.